For centuries, the Royal Marines have served as the Royal Navy’s infantry. From the Americas, to the Iberian Peninsula, the Crimea, China, Gallipoli, and Zeebrugge, the marines have acted as amphibious infantry carrying England through countless wars. In World War II, the Royal Marines made their first landing on 20 April 1940 as the vanguard for the Allied relief force at Namos, Norway. The Allied offensive lasted just a few short weeks, but the marines proved their worth securing the area, while faced with intense Luftwaffe raids and lacking air cover of their own. Shortly there after, the marines were organized in to the Royal Marine Division and deployed troops to every theatre of war, serving in the Netherlands, France, Iceland, the Faeroe Islands, Dakar, Madagascar, Malaya, Burma, Singapore, Crete, and Tobruk, as well as aboard Royal Navy vessels spanning the globe. Due to the success of the Army Commandos’ operations in Norway, the Channel Islands, St. Nazaire, and the Middle East, the Admiralty dissolved the Marine Division in late 1942 and reorganized its amphibious assault infantry in to eight additional Commandos. 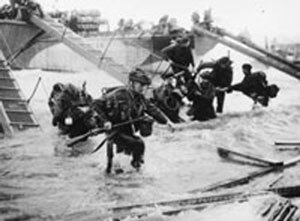 Number 40 RM Commando was the first such unit, seeing brief action at Dieppe, but was fortunate to be assigned to late wave of the landing. Shortly after they came ashore, the tide of battle had clearly swung in the defenders favour and the Commando escaped with most of its strength. Other units were not so fortunate. 40 RM Commando would go on to join its fellow commandos in the Mediterranean theatre. There, No. 41 RM Commando served in Sicily and participated in the seizure of Salerno, but was withdrawn to England following a stiff German counter-attack. Other Royal Marine Commandos would serve in Burma, Italy, Greece and Yugoslavia, while the remainder formed up and trained for the inevitable invasion of Northwest Europe. The Fourth Special Service Brigade was created in March of 1944 specifically for the invasion of France. 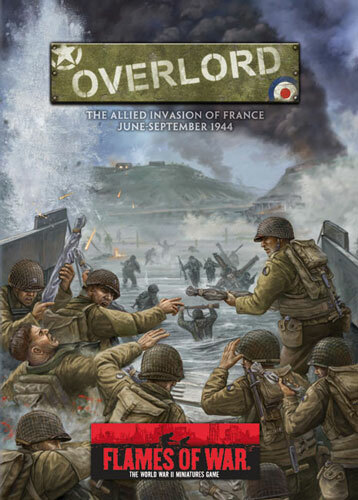 Comprised entirely of Royal Marines, the brigade was tasked with securing the flanks of the invasion beaches, linking up the entire British front from the Orne River to Port-en-Bessin and the Americans on Omaha. The newly raised 46 and 47 RM Commandos joined 41 RM Commando. It immediately became apparent to Allied planners that a fourth Commando was needed for the brigade’s mission, so in mid-March the remaining men of the Royal Marine Division and other volunteers began an accelerated training schedule to form No. 48 RM Commando in time for the invasion. The Brigade was expected to be in combat for at most a week before being returned home, however fate had other plans for them. As planning for the invasion of Europe commenced, the British designed a series of support craft based on the ubiquitous landing craft tank (LCT) to provide additional fire support for the assault troops. From the anti-aircraft LCFs, to the barrage rocket armed LCT(R)s and the naval guns of the LCGs, a myriad of these craft crossed the Channel. Perhaps the oddest of these were the LCT(A)s.
They were simply standard US made tank landing craft with 50 tons of armour affixed to the sides. The LCT(A)s carried Centaur tanks that had been gutted of their underpowered Liberty engines in order to provide more room for ammunition. Royal Marines formed the gun crews of these former tanks, turned floating turrets. However, General Montgomery questioned the wisdom of leaving these tanks floating at sea and insisted that their engines be reinstalled so they could go ashore to act as self-propelled artillery. 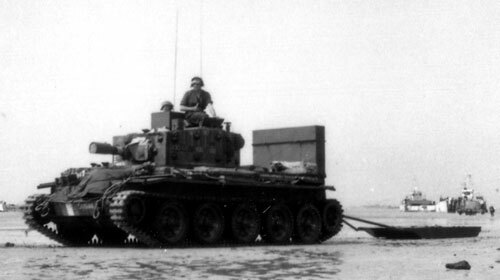 As such, drivers form the Royal Armoured Corps joined the marines completing the tank crews of the Royal Marine Armoured Support Group (RMASG). For the next several months, the new crews trained while the tanks were waterproofed with rubberized paint, their hatches sealed, and their engine exhausts fitted with an extension so they could wade ashore with the first wave of the assault. Additionally, compass bearings were painted on the sides of the turret to assist the gunners and observers in coordinating fire missions. Unfortunately, weighed down by their heavy armour, the LCT(A)s did not fair well, many swamping during the Channel crossing, while others suffered mechanical problems at sea, and still more struck the German mines before unloading their cargo. Only 48 of the 80 Centaurs assigned to the Royal Marines Armoured Support Group made it ashore by mid afternoon. Those that did make it began firing their cannons two miles from shore, adding to the preliminary bombardment. Once ashore, they covered the assault taking out gun emplacements, machine-guns nests, and snipers with their gunfire or simply ramming buildings with the bows of their tanks. As the Royal Marine Commandos moved out along the beaches to secure German strong points and create one continuous beachhead, the Centaurs went along side providing fire support. The most experienced unit in the Brigade, 41 RM Commando, departed Southampton Water at 2130, 5 June, aboard five LCI(S)s to go ashore at Hermanville-sur-Mer and move west to Lion-Sur-Mer then link up with their fellow commandos at Luc-sur-Mer. As the commandos came ashore they faced moderate fire, loosing several men including their RSM, Naval Forward Observation Officer, and second in command, Major Barclay, but once they cleared the immediate beach defences the commandos found themselves in a relatively quite sector. From their assembly area they marched down the coastal road toward Lion-sur-Mer joined by three AVREs. As P and Y troops approached the town a well-concealed German PaK 38 gun ambushed the tanks destroying all three and stalling the assault. The commandos scurried for cover taking up positions on both sides of the road. Their location revealed, the Germans fired a dizzying mortar, rocket, and artillery bombardment, but the commandos were unable to respond as they had expended all their mortar bombs in the initial push on Lion. Meanwhile A and B troops had been moving ahead on their second objective at the Chateau, but were pre-emptively attacked as they made their approach and were forced back towards their comrades. Facing overwhelming defences and artillery, the commandos dug in and awaited reinforcements. At 1330 battalions of the Lincolnshire and Royal Ulster Rifles regiments came ashore then moved up to the Commando’s position bringing with them a replacement Naval Observation Officer. As soon as he arrived, the destroyers off shore began a one hour-long naval bombardment battering the strong point and chateau. Yet it was too late in the day for the commandos to launch an effective assault so as the sunset they dug in for the night. Through the darkness they observed German aircraft raking the beaches with fire and wondered how their comrades were fairing on the other beaches. When dawn broke the German artillery fire began once again pinning the commandos and supporting infantry for another two hours. From over head came the awful drone of three approaching Heinkel bombers. As a flight of Spitfires raced to intercept, the commandos looked up in horror as the Luftwaffe planes opened their bays and rained anti-personnel bombs directly on their position killing several men including their royal artillery observer and severely wounding their commanding officer, Lt Col Gray. Having already lost Major Barclay, command fell to the 23 year old Adjutant John Taplin. Under his command the Commando joined the Lincolns in the final assault on the strongpoint and chateau. Once the two units had defeated the position that had long frustrated their plans, 41 Commando moved out alone to Luc-sur-mer. Fortunately, they found the town undefended and dug in to wait for their comrades to join them from the Canadian beach. 48 RM Commando left England aboard six LCI(S)s bound for Nan Red sector of Juno Beach with the mission to assault the strongpoint at Langrune-sur-Mer and then link up with 41 RM Commando sealing the breach between the Canadian and British 3rd Infantry Divisions. Unfortunately, as the commandos approached the shore, two of their ships struck underwater obstacles and sunk. Weighed down by their heavy gear, many of the marines aboard those two ships drowned in the surf. Those that made it ashore faced intense German mortar, machine-gun, and sniper fire along side the Canadians still trying to secure the landing zone. The combined effect of these two situations was disastrous. 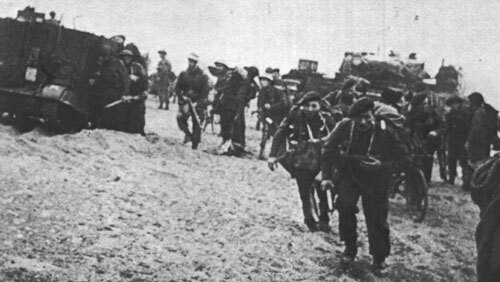 A mere fifty percent of the commando made it off the beach to fight on east of Juno. Once off the beach, 48 RM Commando bypassed WN27 at St. Aubin, where B Company of the Canadian North Shore regiment was still fighting, and the remaining commandos made their way to the heavily defended guns at Langrune. As they approached, HMS Vigilant rained shells down on the position, but achieved little effect due to the heavy fortifications. Upon arrival they found the strong point protected by snipers, mines, machine-guns and an imposing four-foot thick concrete wall. There two Centaurs from 1st Royal Marine Support Regiment joined the attack. The first of these tanks moved toward the wall firing its 95mm howitzer and obliterating a machine-gun bunker that had been covering the crossroads. This allowed B Troop to advance to the wall and prepare for an assault. The commando’s Colonel Moulton then ordered the Centaur to destroy the wall so his troops could assault. Unfortunately, the tank’s 95mm howitzer, designed for arcing fire, could not be lowered enough to hit the base of the wall so the Centaur kept firing with little effect until it had run out of ammunition. The second Centaur began to move in to position, but struck a mine while approaching the wall forcing the crew to bail out and join the commandos. With the Centaur thrust thwarted, B Troop raced across the intersection to an opposing house only to discover that the Germans had sealed all the windows and doors facing the strongpoint with concrete. The commandos had no choice but to bring down the wall. They set a charge at its base, but once again the explosive force was absorbed by the strength of the fortification. As the commandos deliberated on how to next strike at the obstacle, they received news of the 21. 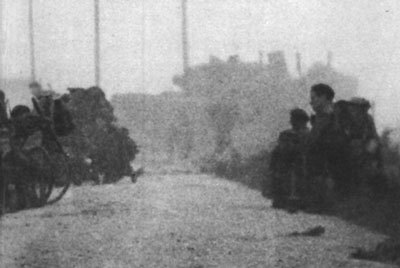 Panzerdivision’s counter-attack that had already stopped the British advance on Caen and was pushing on toward Lion-sur-Mer. The commandos were ordered to cease the assault and take up defensive positions. Hearing the gathering panzers in the distance, they attempted to set up a forward observation post to call in additional fire support from HMS Belfast, but were unable to get through to the mighty warship. Meanwhile, the German Panzergrenadiers reached their comrades in the 716. Infanteriedivision still lodged between the two elements of 4th Special Service Brigade. Lightly armed, unable to call in naval gunfire support, sandwiched between a German strong point and a panzer division, while having suffered extreme casualties, No. 48 Commando needed their luck to change quickly. Fortunately, that came in the form of a massive glider landing by 6th Airborne Division’s follow up regiments to the east. Seeing the flotilla of gliders landing, the German commander feared he would be out flanked and ordered his force to withdraw towards Caen. 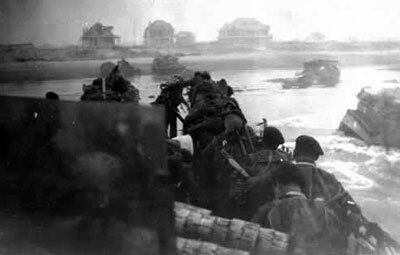 Had he pushed onward and attacked the commandos, Sword beach would have been isolated and the entire eastern flank of the Allied invasion may have collapsed. In the morning the commandos were joined by a pair of Canadian M10s, which fired anti-tank rounds on the wall, cutting clear through it and splashing in to the surf beyond. For an hour the M10s peppered the wall with solid shot and the fortification began to disintegrate. An RMASG Sherman then moved forward, firing high explosive rounds that shattered the wall and allowed the commandos to launch their long overdue assault. Pushing behind the advancing Sherman, with its cannon and machine-guns blazing, the commandos quickly seized the interior of the strong point and spent the rest of the day silencing the remaining pockets of resistance around Langrune. The brigade’s reserve element, No. 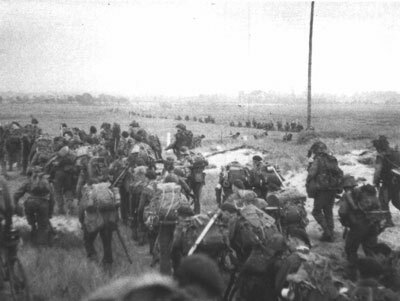 46 RM Commando, landed on Juno beach at 0900 on 7 June and passed their comrades, pressing on to Petit Enfer. 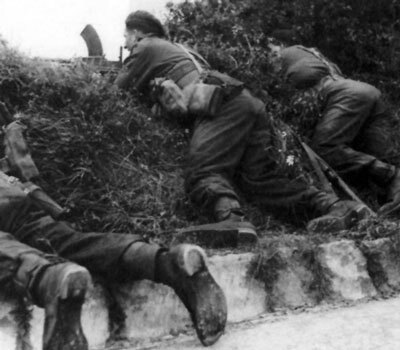 In the aptly named “Little Hell”, the commandos faced stiff German resistance, but were able to force their way through the enemy positions and on to Luc-sur-Mer. There they met up with 41 RM Commando, finally linking Juno and Sword Beaches. Perhaps the 4th Special Service Brigade’s most important D-day objective was the costal town of Port-en-Bessin. Flanked by sheer cliffs, twelve miles west of Gold and three miles east of Omaha, the natural port would not only serve as the link up point between the American and British sectors, but would be the Normandy terminus of PLUTO, the Pipe Line Under The Ocean, which would fuel the Allied advance with petrol pumped directly across the channel from the Isle of Wight. Due to the importance of seizing the port, Lt Col Philips was given the choice of directly assaulting the village alone, or landing on Gold and marching overland to attack the German position from the rear. Remembering the failed raid on Dieppe, Philips volunteered his men for the long march. Unlike their fellow commandos 47 RM Commando left England aboard two large transports, the SS Victoria and Princess Jospehine Charollette. At approximately 0700 they boarded 14 LCAs and began their run in to the beach. From the sea they could see their preceding units were struggling. Due to intense fire, the Hampshires had landed one and a half miles further to the east than originally planned. Their supporting RMASG Centaurs fared even worse. Of the 10 intended to support the Jig Green sector, only 5 made it ashore and four of those were quickly dispatched by German gunfire. Ordered to avoid contact with the enemy and make haste to the vital port, Philips ordered his LCAs to approach the beach behind the Hampshires near Roquettes, further extending their already long march. 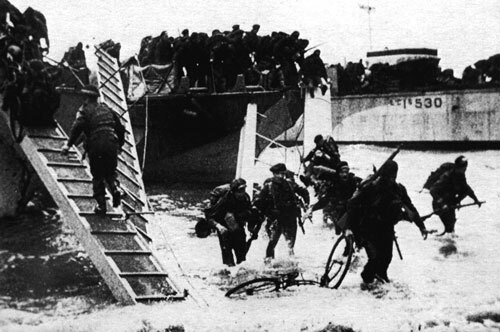 Even taking this safer approach the commandos’ landing craft were severely battered. Five of their craft sunk before reaching the shore and almost all the others were damaged. By the time they reached the shore five officers, including Lt Col Philips, who would swim to shore by late in the day, and seventy-one other ranks were missing. Many who made it ashore had lost their weapons, the commando had but one broken wireless set, only a single three-inch mortar, that had its sight knocked off, and a lone Bangalore torpedo. By the time they made it to the seawall the commandos were spread out over a mile of beach instead of 200 yards as planned. Beyond the wall laid the heavily mined coastal road. Unable to locate Philips, the second in command, Major Donnell led his men off the beach following an advancing Sherman Crab and turned inland to avoid engaging the enemy. Behind the lines the commando moved quickly to Buhot where Philips rejoined it after his long swim. For the next several hours the Commando stealthily pushed on occasionally encountering snipers and small units of unsuspecting rear guards from whom they captured several spandaus (MG-34) and other small arms. As dusk descended upon the Commando they reached Point 72, the highest point on a ridge near Escures, which they thankfully discovered was undefended, but had several fortifications that were in various stages of construction. There they dug in for the night and prepared for the attack on Port-en-Bessin at the break of dawn. In just one day the Commando had traversed over a dozen miles of enemy occupied terrain, with relatively light casualties. Originally the attack on Port-en-Bessin was planned to be supported by American artillery, but having no working radio made this coordination impossible. Furthermore the Americans were still in the thick of their fighting on Omaha. However, the commandos luck changed with the arrival of two French civilians, a replacement Forward Observation Officer, and a Gendarme named Gouget. As the two civilians met with the Commando’s officers and identified the German positions, the artillery officer repaired the unit’s wireless set allowing him to get through to the navy ships off shore. At 1400 two LCG(L)s opened fire on the port and were joined by HMS Emerald’s six-inch guns an hour later. By 1600 the city was hit by RAF Typhoon air strikes and the Royal Artillery bombarded the area with smoke in preparation for the commandos’ assault. In the ensuing confusion, Gouget guided A and B troops through ditches surrounding the town, past the outer ring of guns pits. Meanwhile X Troop fixed bayonets and charged the machine-gun nests quickly taking the positions due to the shock of their assault and the incoming artillery. Once the outer ring of defences had been breached, A Troop advanced on the western feature, but were repelled when two German FlaK ships, that had moved in to the port unbeknownst to the commandos on 5 June, open fire on the men with their rapid fire cannons. Meanwhile B Troop also launched an assault on the town itself, but they were pinned down by a pillbox on the heights and machine-guns concealed in houses throughout the village. In an attempt to reinvigorate the attack Philips ordered his men to launch an assault on the FlaK ships, but the Kreigsmarine once again repelled them. Seeing their comrades fall in the assault, the captains of HMS Ursa and the Polish ship Krakowiak approached the port, but were unable to obtain a firing angle on the FlaK ships, which were concealed behind the port’s concrete and stone breakwater. Desperate to offer assistance, the ships formed boarding parties and launch their motorboats, which, due to their shallow draft, dashed across the harbour net and attacked the FlaK ships. Once the navy had silenced the FlaK, B and Heavy weapons troops made their way up the eastern feature and assaulted the German blockhouse forcing the defenders to surrender. Sporadic fighting continued on until dawn of 8 June when the remaining defenders on the western feature saw the devastation of their positions and ships and surrendered peacefully. In the evening Cpt Isherwood and Lt Bennet set out to the west to find the Americans. On a road west of the town they heard an approaching vehicle and took cover. Bravely Bennet stepped out and confronted the vehicle. Luckily he found them to be the Americans moving off Omaha. On 9 June PLUTO arrived in the form of an army port company and the petrol started to flow, supplying Allied vehicles across the Normandy front. After a short rest and reinforcement the 46, 47, and 48 RM Commandos moved south to the Douvre Radar Station. This massive fortified complex was the primary Luftwaffe radar station in the area. Almost ten acres in area, littered with gun pits, mine fields, tunnels, bunkers, five 5cm anti-tank guns, a 7.5cm field gun, and a twenty foot ring of barbed wire, the site was far more than the commandos could tackle alone. Instead the commandos’ job was to isolate the station allowing other Allied forces to pass by undeterred in their push on Caen. 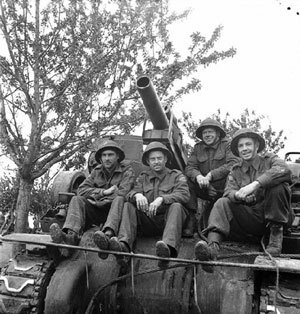 After a few days of securing the perimeter, 46, 47 and 48 RM Commando were sent to support the Canadians and Airborne divisions while 41 RM Commando stayed behind. For the next week the commandos continued to harass the strongpoint with occasional mortar fire, typhoons strikes, and volleys from two attached RMASG Centaurs. Although the site did not actively threaten Allied movements in the area it did provide radar-ranging information for Luftwaffe night fighters and constantly reported on British movements. Likewise, it was able to fire on a nearby landing strip that the RAF hoped to use as a forward operating base for its Typhoons. The site had to be silenced. On 17 June the assault began with a bombardment from the Royal Artillery’s 7.2 inch guns and ships off shore. 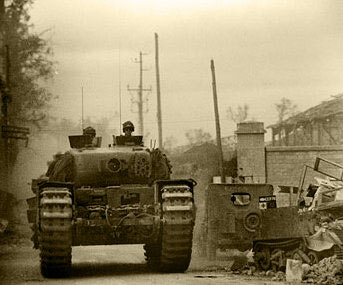 Under their new commander, Lt. Col Palmer, 41 RM Commando and forty-four armoured engineering vehicles attacked from the north while other tanks created a diversion from the southwest. The Sherman Crabs cleared the way through the minefields while the AVsRE battered the bunkers with their enormous cannons. The effect of such fire was devastating on the morale of the entrenched German defenders. When the commandos entered the entrenchments, spraying the Germans with submachine-gun fire, it was clear that the station could no longer be defended. The two hundred and twenty seven remaining Luftwaffe troopers quickly surrendered and the last of the 4th Special Service Brigade’s D-Day objectives was finally achieved. While 41 RM Commando dealt with the radar station, the remainder of 4th Special Service Brigade moved to the Orne River Basin, where they joined their fellow commandos of 1st Special Service Brigade and the 6th Airborne Division, all falling under command of Major-General Gale. There they would spend the next month anchoring the Allied flank while Montgomery launched his series of assaults on Caen. In true commando style, Brigadier Leicester had his men conducted frequent patrols and raids across no man’s land in order to keep his men in fighting shape and the German defenders engaged. The Brigade would remain in the Orne area until mid August. In mid August, following the capture of Caen, General Gale’s forces broke out of their positions and launched a major offensive to dislodge their long time foes. Before sunrise on 20 August, 46 RM Commando launched an attack on the heights above Putot. There a savage close-quarters battle ensued and the commandos seized the position over looking the entire Dozulé area. For much of the day, 48 Commando pushed through the bocage, without support, to Point 134 and Point 120 followed by 41 Commando. This location nearly cut off the Germans escape route from the town. However, the attack on the town was delayed until to first light on 21 August. Realizing that they had been out flanked the Germans set the village ablaze and withdrew. With Dozulé captured the advance picked up pace as the Commandos pushed on through Beuzeville to the Risle River. On many occasions the marching commandos and airborne troops would arrive in a village less than hour after the Germans had made a hasty withdrawal. 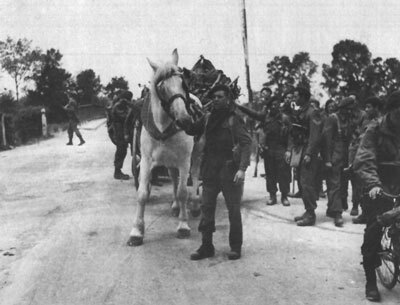 Following the capture of Pont-Audemer, the 6th Airborne and 1st Special Service Brigade were relieved by the 49th Division and returned to England. However, the marines of 4th Brigade would remain fighting for several more weeks clearing pockets of resistance between the Seine and Valmont then took up the role of garrison troops in and around the shattered city of Le Harve. Battered by intense Allied bombing and heavy fighting when the 49th and 51st Divisions seized the port, Le Harve’s citizens were starving and downtrodden. The commandos had to take on the unenviable role of policemen holding supplies from needy civilians in order to keep the supplies following to the front. Fortunately, for their morale, they moved out once more and took up positions near Dunkirk probing the German lines with frequent small raids. On 27 September the Brigade was withdrawn from the line, not to England, but to assembly areas in De Hann, Belgium. There they prepared for another amphibious assault, this time on the Dutch island of Walcheren. The island lay at the mouth of the Scheldt River, which ran from Antwerp to the sea. Until the island and the northern banks of the river were occupied, the port of Antwerp could not be used to support the Allied advance. On 3 October Allied bombers breached the dykes at Westkapelle, Flushing, and Veree, flooding the island leaving only a few dry areas around the perimeter of the island, greatly restricting the Germans’ freedom of movement. The 4th Special Service Brigade formed the seaborne element of the attack while British and Canadian infantry attacked overland from the mainland. This time the commandos came ashore in LVTs, which had already proven their value in the Pacific campaign. 41 Commando was tasked with assaulting the town of Westkappelle then to move north along the causeway to Domburg. Just to their south 48 Commando took on a radar station and naval gun battery, while 47 completed the encirclement of the western part of the island by moving south towards Flushing. The brigade would spend the rest of the war making raids across the Maas River in Operations Incalculable and Bogart. Many of the 4th Brigade’s commandos would go onto fight again in the Far East while others took on occupation duties in Europe. 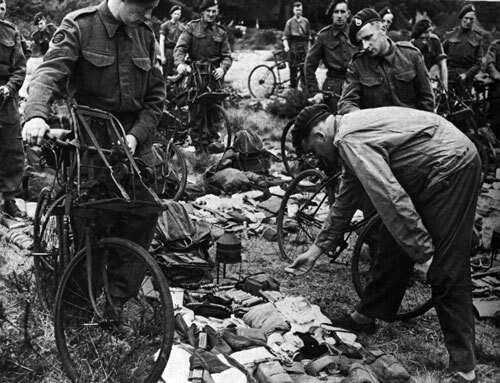 In 1946 all commando operations were centralized under the command of the Royal Marines. Their decedents would be called on time and again to defend British interests at home and abroad. The Intelligence Hnadbook Overlord can be used to field a Royal Marine Commando troop for Normandy in Flames Of War.